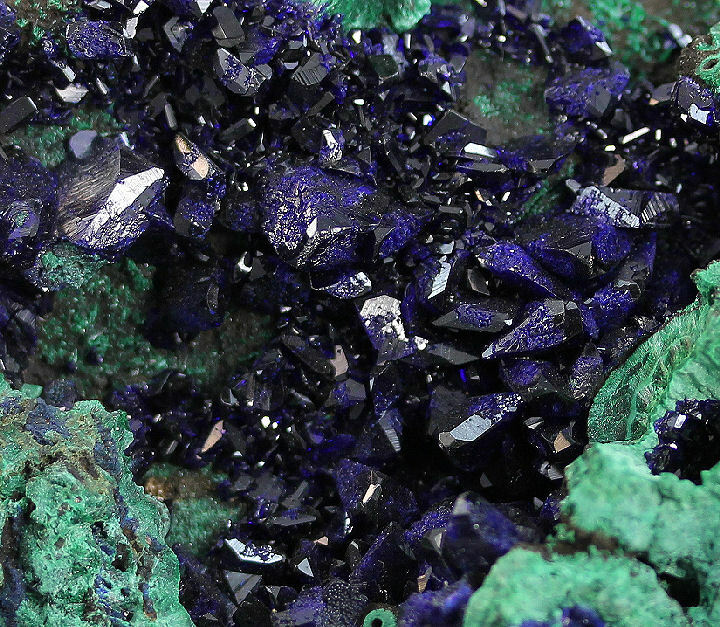 Check out the Azurite with Malachite, Sphalerite with Calcite, Fluorite on Barite, Pyrite, Mimetite, Green Fluorite on "Starburst Amethyst"', Quartz var. 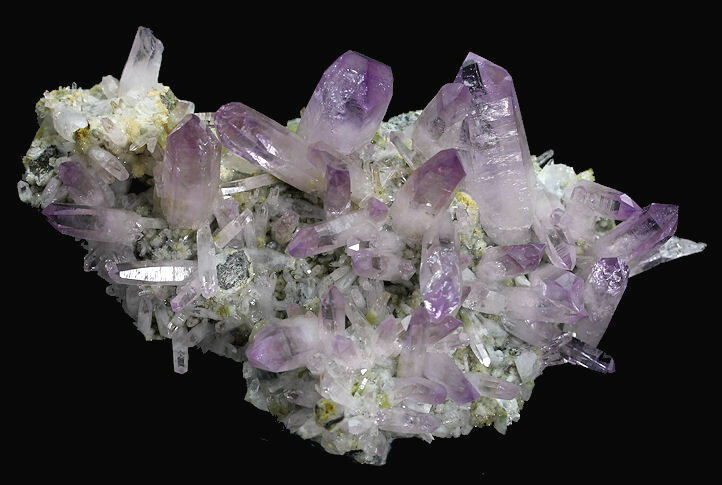 Amethyst, Quartz with Dolomite, Pyrite & Ferberite, Titanite (Sphene) Crystals on Matrix, Enargite, Apophyllite with Green Inclusions on Stilbite, Titanite on Rutile ps. after Ilmenite with Albite, Tangerine Stellerite, Chalcopyrite with Quartz & Calcite, Green Apophyllite with Stilbite, Creedite, Epidote on Quartz, Barite, Adamite on Limonite, Stibnite with Calcite, Wulfenite on Limonite, and Celestite mineral specimens on this page. Very unusual and rare specimen of gemmy Apophyllite crystals with a pleasant green color due to inclusions of Hedenbergite adorned on a group of lighty salmon colored Stilbite crystals. Rare specimen consisting of platy Ilmenite crystals with irregular contours and completely pseudomorphed by Rutile and coated with numerous very sharp pistachio green, Titanite crystals. The Titanite crystals are lustrous and bright with well defined faces and edges. Also adorned with white Albite crystals. In fine condition. 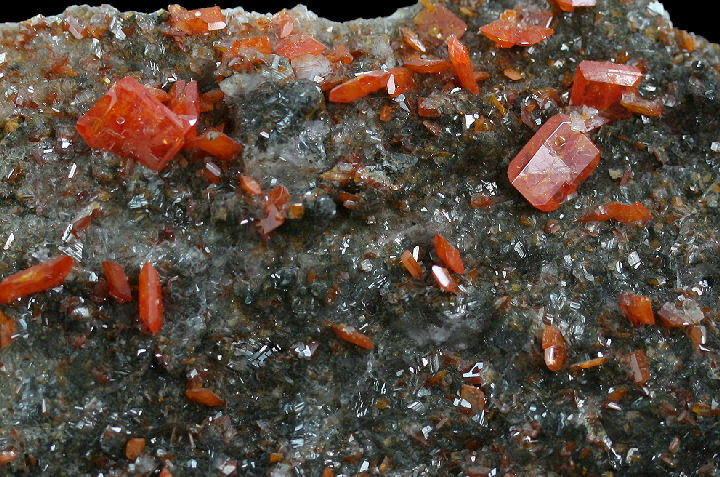 Gorgeous cluster of highly lustrous, tangerine colored Stellerite crystals from a recent new find in Sakur. 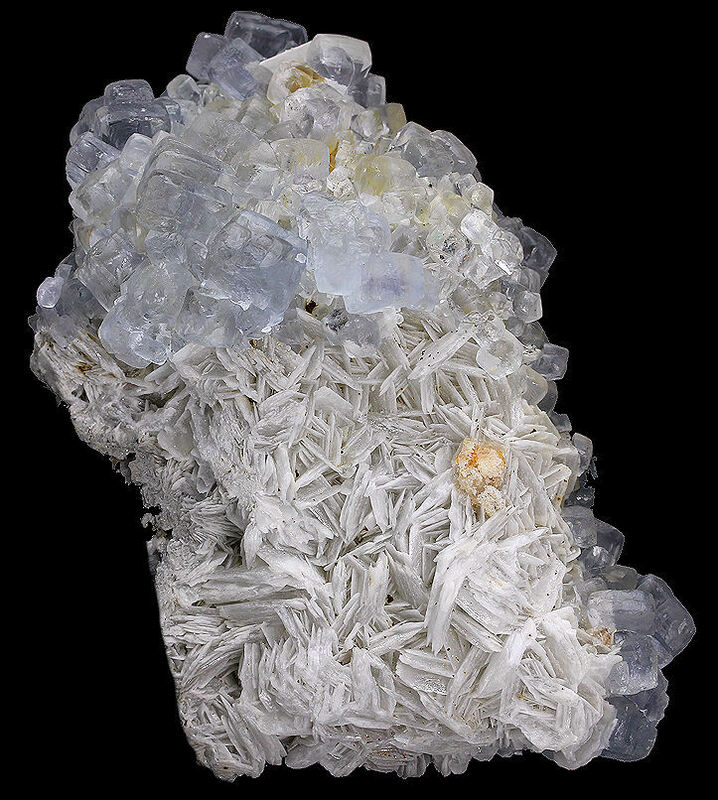 Stellerite is the rarer cousinof the more common zeolite Stilbite. In excellent condition. Golden, Chalcopyrite Crystals with Quartz partially coated with white Calcite crystals. The mines in Romania have been closed for years and good specimens are less available for collectors. This is a nice one to grab. Interesting formation of light green, gemmy Apophyllite crystals with some minor Stilbite from a recent find in Nasik. No damage. Beautiful large ball of radiating bright orange Creedite crystals. Superb specimen of dark pistachio green, gemmy Epidote crystals on a cluster of glassy Quartz. This is one of the best specimens of this type we have seen in some time. In fine condition. Golden, tabular crystals of Barite on matrix from the famous Meikle Mine. Nicely translucent and aesthetic formation. In fine condition. 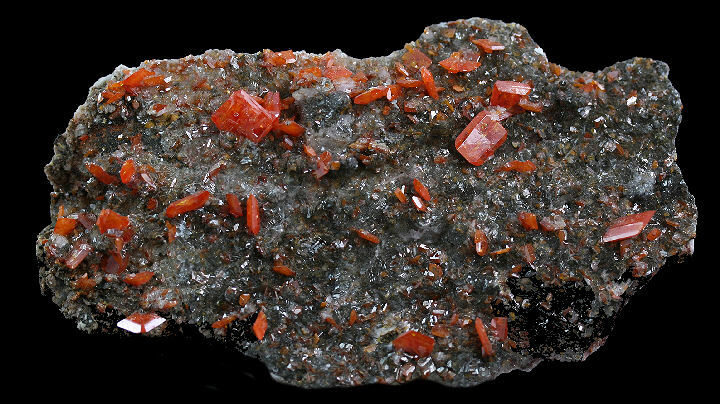 a Limonite matrix with additional scattered Adamite crystals. Nice luster and fluorescent under UV light. In fine condition. Pretty teal-blue colored Fluorite crystal with high translucense. 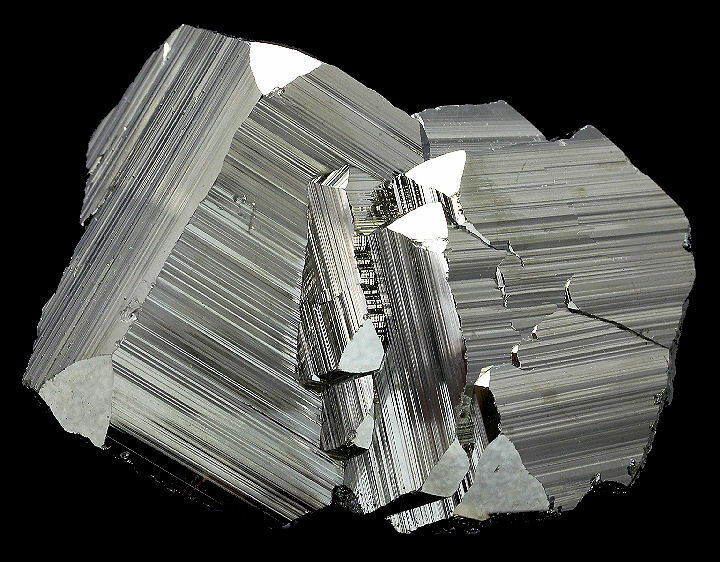 Quite a nice specimen with well terminated Stibnite crystals adorned with Calcite. Presents well on all sides. In very good condition. Neat formation of gemmy Amethyst crystals. 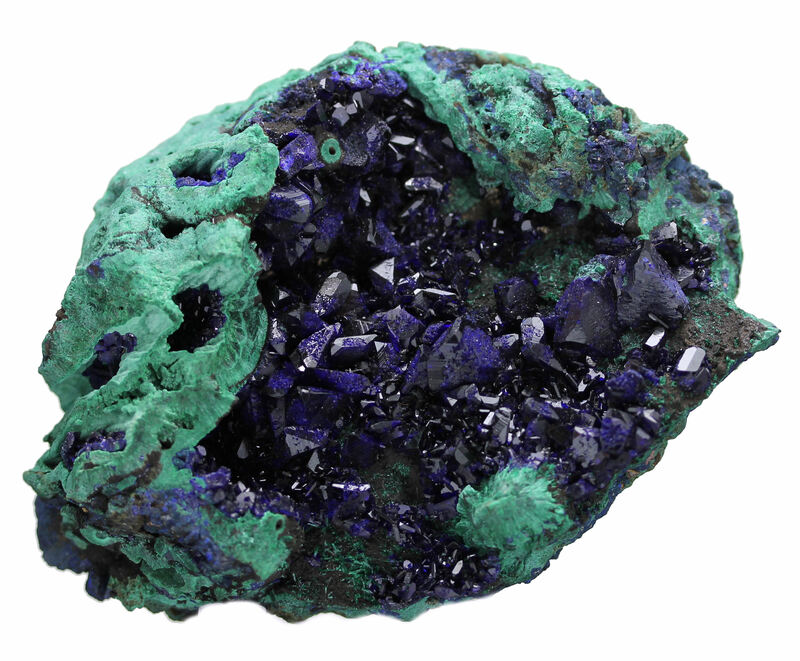 Very nice specimen with well formed, lustrous Azurite crystals in a vuggy-like cavity surrounded by Malachite. From recent finds in the Liufengshan Mine. 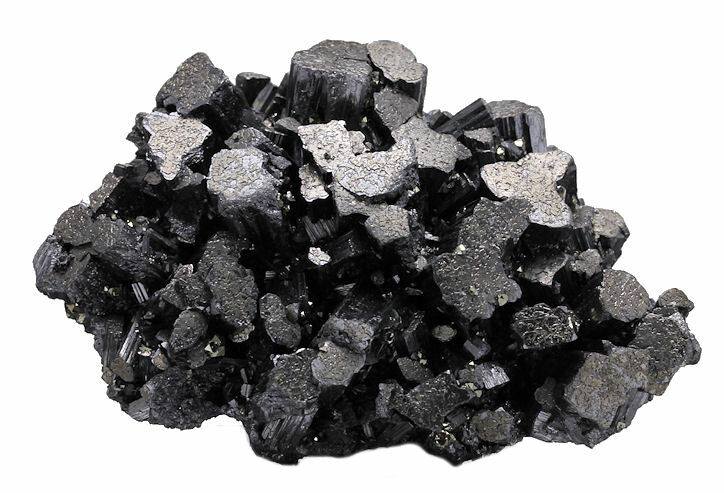 Cluster of jet black, sharp, complex crystals of Sphalerite with an upper trim of Calcite. Even better in person. 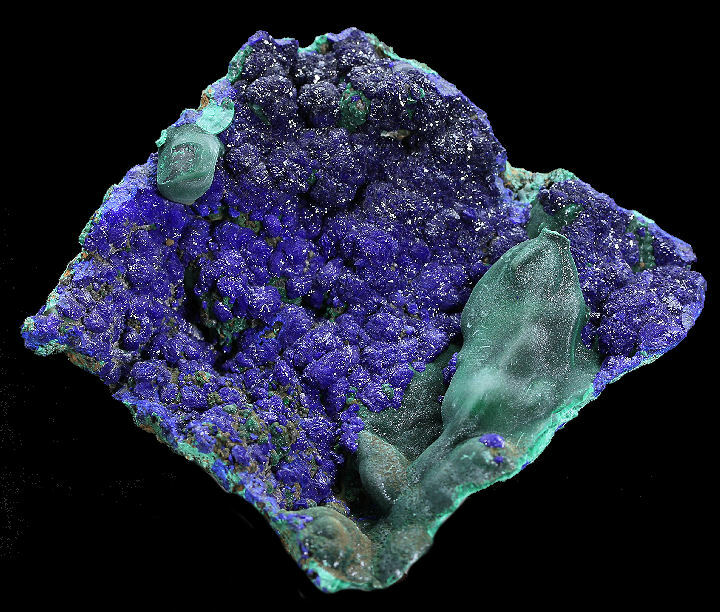 Attractive plate of lustrous Azurite and Malachite. Beautiful glassy, light lavender Fluorite crystals with unusual rounded edges on a white, bladed Barite covered substrate from the less well known Asturias Jaimina Mine. A rare combination specimen from this locality. Displays well from all sides, but top photo is the best presentation. In very good condition. "The crystalline habits of the fluorite that can be found in this deposit are: tetrahexahedron, cube and rhombododecahedron combinations, cube, octahedron and rhombododecahedron combinations, cube and tetrahexahedron and other even more complex associations. 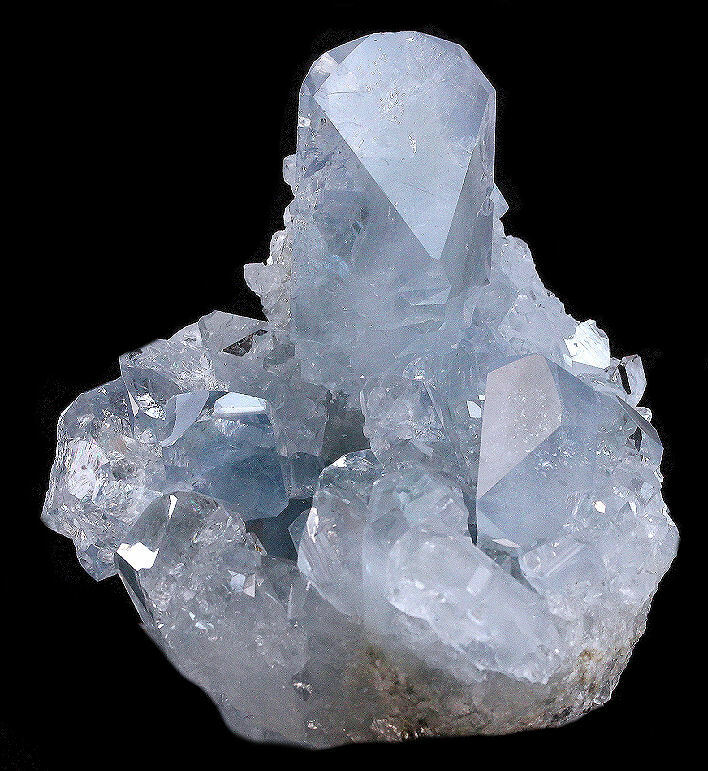 This diversity of habits, so uncommon in other fluorite deposits, is one of the hallmarks of this mine" (From Mindat.org). 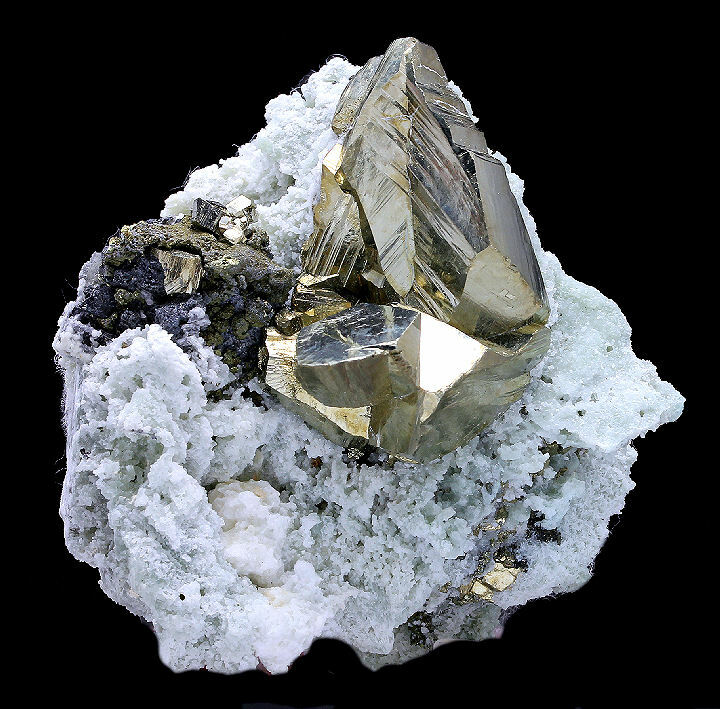 Interesting habits of light golden Pyrite on Sphalerite matrix. Pretty cluster of light lavender Fluorite crystals from the less well known Jaimina Mine in Spain. 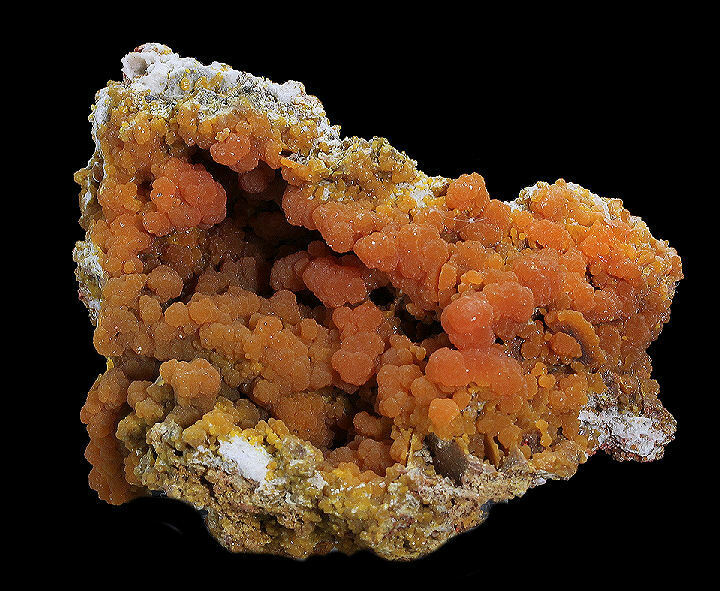 Rich orange, lustrous botryoids of Mimetite filling a sculptural vug from recent finds in an obscure mine in Iran. A glowing translucent green Flourite crystal on Starburst Amethyst. 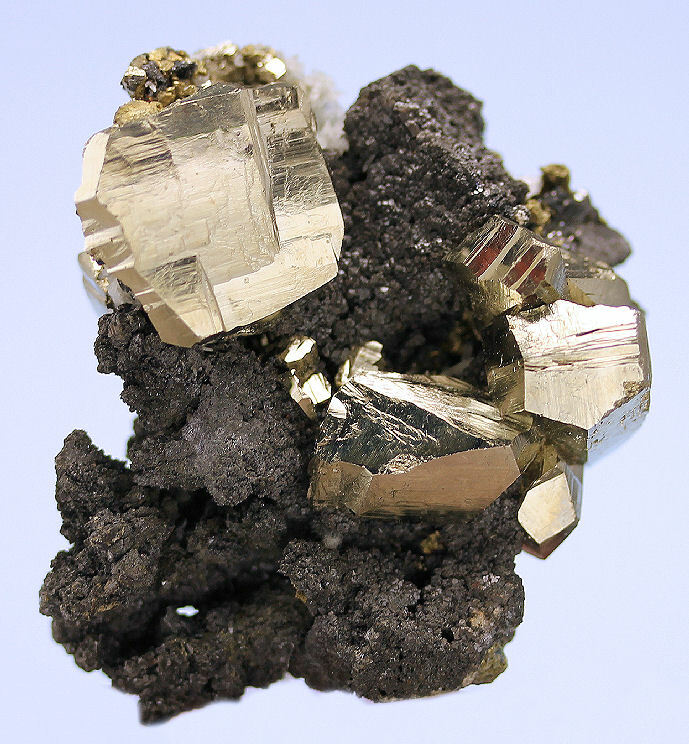 Unusual habit of Pyrite on matrix of Calcite and Sphalerite. Excellent plate of the famous purple tipped Amethyst Quartz from the Las Vigas finds. 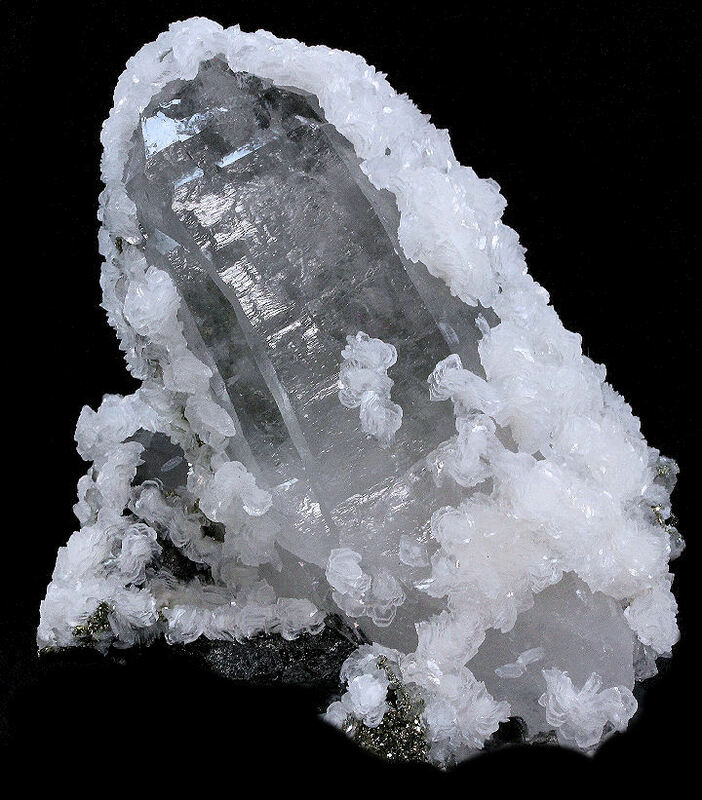 Aesthetic combination of a glassy Quartz crystal, with trimming of translucent Dolomite crystals, on a matrix of Ferberite with Pyrite. Gemmy, green Titanite crystals on matrix. Such rich and large Titanite specimens are hard to come by these days. Enargite is a somewhat rare copper mineral and it does not often form well shaped crystals, which makes this specimen a fine addition to any collection. 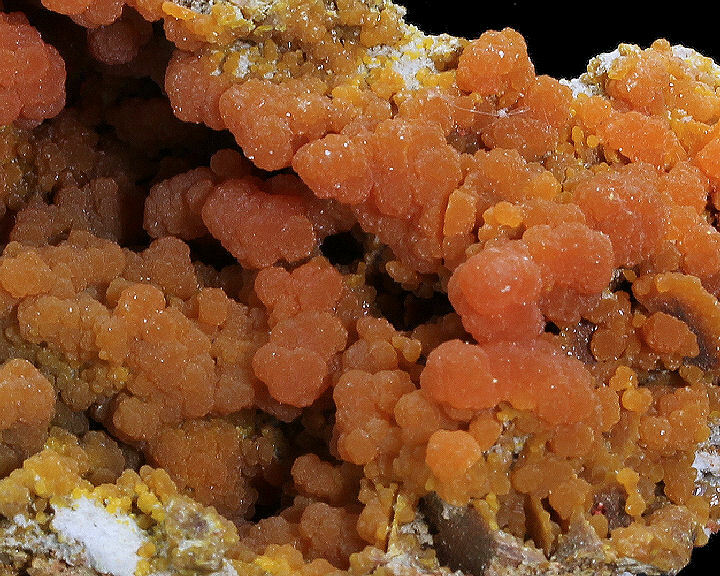 Gemmy and lustrous, reddish-orange Wulfenite crystals to 9 mm are richly and aesthetically strewn on Limonite matrix with some scintillating, water clear Calcite rhombs from the now closed Red Cloud Mine. Very nearly pristine, with only one gently bruised crystal, for such rich coverage. 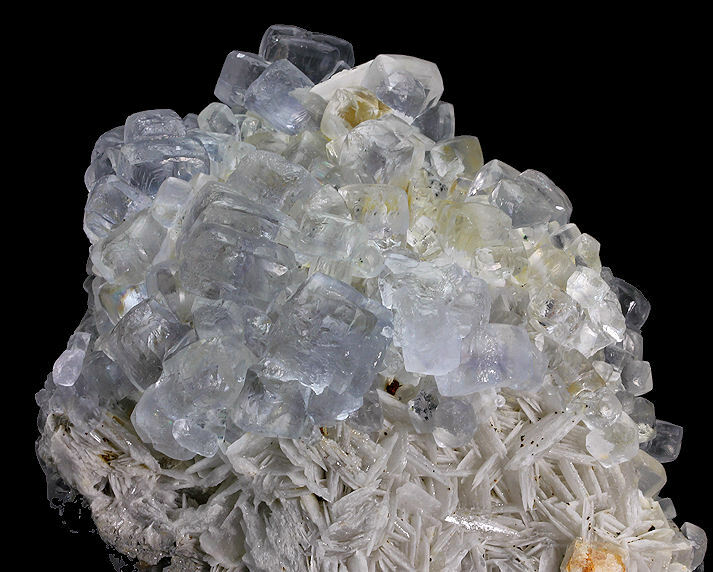 Super specimen of gemmy, sky-blue Celestite crystals, with prominent central crystal. In very good condition. Very nice Pyrite cluster with some beveling and surface striations.